TeleRead is for people who love books and gadgets. We write about Kindle-type e-readers, phones, tablets, other devices and apps in a practical way. In line with our original mission, we also strive to help narrow the digital and reading divides. We are gung ho on innovations like the all-digital Bexar County BiblioTech Library, as well as the creation of a national digital library endowment (that’s a photo from Bexar—we are not associated with the library). But we go back to the 1990s and also see a place for paper books. TeleRead is the world’s oldest Web site devoted to general-interest news and views on e-books and related topics. We’re for everyone, not just one of our favorite groups, librarians. We’ve been featured, quoted or mentioned on Huffington Post, Wired, Slashdot, Washington Post, AdAge, Computerworld, BoingBoing, Engadget, O’Reilly Radar, MobileRead, Publishers Weekly, The Bookseller and numerous blogs about technology and books. Please visit our archival site at TeleRead.com. We recently switched back to our original address of TeleRead.org. TeleRead uses StatCounter for tracking traffic patterns, not for marketing. About copyright or any other legal issues, please contact our editor and cc our publisher. Regarding advertisement, we are not accepting any right now—this may change. The only ads on this site are WordPress.com inserts, which do not bring us any revenue. This “write for us” invitation is only for nonmarketers, not “content writers” seeking to promote products. Contact us only if you’re a normal mortal with helpful tips or opinions to share on e-books, libraries or related topics. We’re especially interested in submissions on digital divide issues, or on access to e-book-related technology for people with disabilities. No pay, sorry. We’re all volunteers here (although it would be wonderful if you tipped Chris Meadows, our main contributor, or clicked on his clearly identified Amazon affiliate links, which benefit him, not us). TeleRead exists to advance the interests of e-book lovers and society in general, not make money—the two goals so often clash. Chris Meadows grew up in southwest Missouri, and attended college at Southwest Missouri State University in the late 1990s. That was when he first became interested in e-books, when the Palm and Visor PDAs dropped into his price range. The first commercial e-book he bought, from Peanut Press, was Vernor Vinge’s A Fire upon the Deep. (He would later review it for Slashdot.) In years to come, he would buy many more, especially from Baen which had just launched its own e-book program around that time. It was also in the late 1990s that Chris first began writing professionally, for a pay-per-click website called Themestream. One of his articles, about anime’s move toward DVD, was his first to make Slashdot. It would not be his last. His other writings for the site included a column about the Palm and other PDAs, which prompted Jeff Kirvin to invite him to write for his blog “Writing on your Palm.” In 2006, Chris made his first post for TeleRead, for which he has continued to write almost continuously ever since. More recently, Chris’s review of the new Fire tablet made Slashdot again. Chris’s current e-reading devices are his Android smartphone and tablets, and a Kindle Paperwhite. To connect these to the Internet, he uses a Karma Go pre-paid 4G hotspot. Those are far from the only gadgets he carries, however. Aside from his writing, Chris has also recorded a number of podcasts. Click here to discover episodes of Chris’ The Biblio File, a podcast about books, reading and the publishing industry in general. And click here to check out episodes of Space Station Liberty, Chris’ podcast about Robotech, the American-made sci-fi anime series that first appeared in the United States in the mid-1980s. Chris also hosts TeleRead’s own podcast. 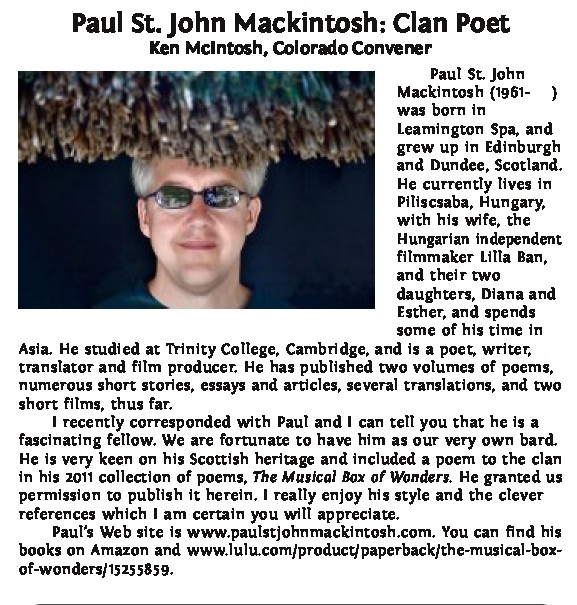 Paul St John Mackintosh is a British poet, writer of dark fiction, and media pro. He was educated at public school and Trinity College, Cambridge, but modern technology saved him from the Hugh Grant trap. Paul has lived and worked in Asia and Central Europe, and currently divides his time between Hungary and other hangouts worldwide. His acclaimed first poetry collection, The Golden Age, was published in 1997, and reissued on Kindle in 2013, and his second poetry collection, The Musical Box of Wonders, was published in 2011. His co-translations from the Japanese include Nip the Buds, Shoot the Kids (1995) by the 1994 Nobel Prize-winner Kenzaburo Oe, and he has co-produced award-winning short films. He is also an official clan poet of Clan Mackintosh. Paul first got seriously into e-books in Hong Kong, where he spent 12 years doing branding and IR for dotcoms and later as managing editor of the Asian Venture Capital Journal. Hooked on small mobile devices since the days of the Psion 5 and Newton MessagePad 2100, Paul fell for the cheapness and convenience of e-books versus Asia’s overpriced, understocked English bookshops. He has had his ideas, sensibility and attitudes transformed by many e-books in succession, from China Mieville to Peter Watts. He used to be an iPhone fanboy, but the aversion therapy worked. Paul prefers to write freehand on touchscreens using HWR. His haul of discarded styluses and obsolete portable devices—none of them running their original OS—is embarrassingly large. When not out getting dark and twisted in Eurotrash haunts, Paul reads on his Nexus 7 and a ZTE Skate hacked to Cyanogen Paranoid JellyBean, publishes through Amazon and Henrik Harksen Productions, blogs at www.paulstjohnmackintosh.com, Facebooks at https://www.facebook.com/PaulStJohnMackintosh, and Tweets for democracy @pstjmack. I’m a journalist, a teacher and an e-book fiend. I started my career as a writer, working in both media and corporate communications. In 2005, I changed directions and spent the year overseas getting my teaching degree—and my first taste of e-book reading! During a year in small-town New Zealand, where the selection of books was limited and expensive, I found Project Gutenberg and started reading on a Palm PDA. My sister later introduced me to Fictionwise, and from there I progressed to Kobo and Amazon and a whole new world. Now that I am back in Canada, I work as a French teacher at a K-3 private school. I use drama, music, puppets, props and all manner of tech in my job, and I love it. I enjoy moving between all the classes and having a relationship with each child in the school. Kids are hilarious, and I enjoy watching them grow and learn. I live in Toronto, where real estate is expensive, so I appreciate that ebooks allow me to buy and own as many books as I want without taking up valuable shelf space in my home. I moved in with my sweetie earlier this year, so I have his stuff to store, too! Thank goodness he’s been bitten by the e-book bug as well. We spent a portion of our first date buying him a Kobo, and between us, we have a tech arsenal of almost a dozen devices with which we can access the net. There’s his computer, my computer, his e-book reader, my e-book reader, a Nexus tablet we share, an iPad we don’t share, his phone, my phone … it’s a great time to be a tech-hound! My current device of choice for reading is my Amazon Kindle Touch, but I have owned or used devices by Sony, Kobo, Aluratek and others. I also read on my tablet devices using the Kindle app, and I enjoy synching between them, so that I’m always up to date no matter where I am or what I have with me. An iPhone is going to be my next big purchase! I used to be a library junkie with books piled on my nightstand. I’d be constantly renewing books until I finished all of them. There had to be a way to escape the clutter. That’s when I discovered e-book apps for my old Blackberry. I bought plenty of books and read and read and read. I even developed what I called ‘Blackberry Eye,’ small wrinkles under my eyes from staring down at my phone all day. After jumping into the digital book world, I haven’t looked back. Six years later, I have the original Nook, Nook Touch and a Nexus 7. I spend plenty of time reading on my gadgets, but still have the occasional physical book thrown in from the library. But like any of my hobbies, I always end up wanting to write about them. Writing is my favorite form of expression, and writing about books and the industry came naturally for me. TeleRead inspired that process. I used Calibre to download posts from the site onto my Nook – and suddenly, a wealth of publishing information was at my fingertips. In the end, I wanted to know more. It’s what always drives me. My professional background involves news media. I’ve worked as a sports reporter since 1998—did I mention I love to write about my hobbies?—and have covered everything from the Super Bowl and the World Series to professional volleyball, car racing and even local rec leagues. I’ve also covered traditional breaking news—hurricanes barreling down on the Northeast, for instance, and the massive blackout in 2003. I’m currently the football and hockey editor of Beckett Media, covering the trading card and sports memorabilia industry (there goes that hobby thing again). I oversee two monthly publications and create content for the Web. I also have strong digital and social media focuses. One of the things I love about TeleRead is that it’s a central place to find what’s important about the publishing industry, and I want to use my journalism experience to bring important news to TeleRead’s audience. If you have any ideas or comments, feel free to email me, or contact me through Twitter. Joe is director of strategy and business development at Olive Software, which serves the newspaper and book industries, among others. Prior to joining Olive, he was general manager, publisher and chair of the Tools of Change (TOC) conference at O’Reilly Media, Inc. Joe managed each of the editorial groups at O’Reilly as well as the Microsoft Press team and the retail sales organization. Before joining O’Reilly, he was vice president and executive publisher at John Wiley & Sons, Inc., in its Professional and Trade Division. These days, beyond his Olive work, Joe publishes a lively blog called Joe Wikert’s Digital Content Strategies: An industry critic’s view of our rich content future. Susan Glinert Stevens has been a freelance programmer, writer, and graphic designer since 1981. Our Editorial and Production Overload was an editor with Dow Jones-Irwin and later a technical editor for PC Tech Journal. She has written thousands of articles for trade magazines, includingCreative Computing, PC Sources, Windows Sources,Home Office Computing, and Computer Shopper. Susan specializes in technical writing, editing, and book layout, but also enjoys troubleshooting computer system troubles and writing the occasional program. At TeleRead Susan will be working on special projects, including formal editorial guidelines, and will help run the TeleRead Skunk Works, aka the Camel Works, the first employee of which appears under her in the photo. She lives in Georgia with a husband named Roy, a rabbit named Rambo, a cat named iPod, and an iPod named Cat. Sometimes you just have to imagine things to help them exist someday. Two decades ago, the irreplaceable Project Gutenberg was around, but was most useful to people with Internet connections. The Net-less included me. For myself and the rest of the world, I wanted not just Gutenberg-style public domain classics, but also instant access to many more copyrighted books than I could find at my local public library. I especially craved the right gizmos to read them on. From just a cause, TeleRead became an Internet-based news and views site, too, and you can read our history below, and even follow links to postings from the 1990s, after I finally got on the Net for real—not merely through CompuServe. Today I run LibraryCity.org and own variants of the technology that other crazies and I were pushing two decades ago, everything from an iPad to a Nexus 6 phone and Kindle Oasis. No conspicuous consumption here. Besides wanting to keep up with the ever-changing e-book scene, I love variety in my reading devices. That’s one reason I’m so gung ho on e-book standards, beyond the need for great books not to vanish in a Tower of eBabel. With the right standards and archiving in place, E could actually last longer than P, and this means plenty to me. Many and perhaps most of my favorite writers are out of popular favor today—for example, Theodore Dreiser, George Gissing and Sinclair Lewis (the latter strongly influenced by another favorite, Dickens). I myself am author of The Solomon Scandals, a Washington corruption novel published both on paper and electronically by Twilight Times Books. A mix of suspense, satire and tragedy, Scandals just might be the only book that ends with a bio-enhanced Afghan Hound doing a Harry Truman imitation at the Cosmos Club. I have no idea if Scandals will be read a millennium from now—I’ll place my biggest bets on Dickens, Jane Austen and Herman Melville—but well-implemented-and-funded digital libraries certainly won’t hurt. TeleRead goes back to the early 1990s, when David H. Rothman, the site’s founder, made a proposition in a Computerworld article for a well-stocked national digital library. In that sense, the word “TeleRead” means a much-evolved proposal for such systems in the United States and elsewhere (tightly integrated with local libraries and schools, as opposed to relying excessively on centralization). “Let the librarians—most of whom would work for local, state and university libraries rather than TeleRead—live anywhere,” David said, and, in fact, that is the same philosophy of the Harvard-originated Digital Public Library of America. None other than David’s political opposite, the late William F. Buckey Jr., the conservative columnist, wrote two “On the Right” columns in favor of the basic plan. Of course, “TeleRead” also refers to this site, which covers many e-book-related topics, not just library ones. TeleRead was a powerful voice for e-bookdom—perhaps the leading advocate on the Net, not counting Gutenberg—when most librarians and academics were questioning the practicality of e-books and massive digital libraries. We helped turn them around. Search the databases for citations, and you’ll find the fight in the 1990s for a well-stocked national digital library system and due attention to access issues and popular items—not just academic content—was much lonelier than it should have been. The TeleRead vision as it existed in 1996 was the last chapter of Scholarly Publishing: The Electronic Frontier, an MIT Press/ASIS information science collection. But that happened only because Greg Newby, the collection’s co-editor and Project Gutenberg’s executive director under the late Michael Hart, was an extraordinarily prescient info-populist. By way of CompuServe and the Net, including the Communet mailing list, David spread his ideas, and over the years he would write further about the TeleRead concept in other places ranging from the Washington Post to the Baltimore Sun, U.S News & World Report, the Web site of Publishers Weekly (for which David was a regular blogger at the time), TheAtlantic.com, the Huffington Post and the Chronicle of Higher Education. Going far beyond the library system, he also called for the popularization of book-friendly hardware. TeleReaders, as David originally imagined them for ComputerWorld, would be multimedia-capable machines with thin, lightweight 12-inch screens and CPUs and memory chips inside, and able to work with detachable keyboards. A bit iPaddish. Then as now, David cared endlessly about the quality of e-book displays, complete with a pointer to E Ink’s thoughts on the matter. Other topics from the early 2000s will be familiar to readers today—for example, e-bookstore wars, the boom and bust cycles of the industry, copyright, e-books and K-12, e-book accessibility for people with disabilities (of special interest in time to Amos Bokros and Robert Kingett, two TeleRead contributors), the role of libraries in society and the disruption of traditional publishing (written on by Sadi Ranson-Polizzotti, to whose small press Saul Bellow was an advisor). But the topic that really set apart TeleRead, in addition to the repeated calls for well-stocked national digital library systems in the U.S. and elsewhere, ended up being a universal e-book format for reflowable text. TeleRead teamed up on this cause with the OpenReader Consortium, a group led by Jon Noring, a frequent TeleRead contributor, with help from David. OpenReader’s existence in turn jogged the main e-book trade group, the International Digital Publishing Forum, into creating the ePub consumer standard now used by Apple, Sony and other giants. Proprietary DRM, a repeated target of TeleRead commentaries, is why even ePub files are not always readable on various brands of machines. But TeleRead’s battle against it goes on. DRM’s harm to readers and literature alike has led to some of the most impassioned posts by past and current TeleRead contributors, such as Robert Nagle, Branko Collin,Roger Sperberg, Garson O’Toole, Senior Writer Joanna Cabot and Senior Contributor Chris Meadows (now returned to TeleRead after a short absence from it). Robert also ran the back end of the site. In 2008, David suffered a heart attack and had to undergo an emergency quadruple bypass, but the site went on almost uninterrupted thanks to Paul Biba, a veteran contributor and a dedicated e-book fan in New Jersey. Two years later David sold TeleRead to the North American Publishing Company (NAPCO) to focus on his health, reading, other writing and a return to his roots as an e-library advocate, which he has done through the LibraryCity.org site, from which TeleRead has often reproduced his Creative Commons-licensed posts.Philanthropist Irvin Borowsky founded NAPCO, and among the Borowsky family’s past holdings was the magazine that became TV Guide—his son Ned runs NAPCO today. While TeleRead.org covers e-book-related commerce, the site still offers its share of news and commentaries reflecting the public interest and society’s cultural needs, as opposed to simply functioning as a trade publication. As a community of readers, not just an echo chamber for the publishing elite, it is all the more valuable to the industry. TeleRead posts community members’ comments in a sidebar. They add considerably to the value of the site. What’s more, TeleRead commenters with good track records can become contributors featured in the main part of the blog—that is how David recruited Paul and others. Commenters and contributors needn’t agree with the community at large. If anyone wants to publish a pro-DRM essay and it’s well-done, TeleRead will post it. Paul officially took over from David as TeleRead’s main editor in 2010. He left in summer 2012 to focus on other activities, including a cross-country motorcycle tour, and his replacement was another e-book fan, Dan Eldridge. A well-respected travel book author and a seasoned journalist, Dan has freelanced for the New York Times, the Daily Telegraph and other major publications, in addition to serving as a music critic at the Pittsburgh City Paper and copy editor of the Philadelphia Weekly. Juli Monroe, Dan’s successor in 2013, is an e-book reader going back to the era of the Handspring Visor Deluxe. A University of Kansas journalism alum, she is a business coach and expert in social networking and owns the well-named 1to1Discovery. She has written The Enthusiastic Networker and a Warlock series among other works—here’s her Amazon page with links to all her books. In 2015, with old and valued consulting clients tugging at her to devote more time to them, Juli left TeleRead. We’ll miss her. She offered valuable business advice for the (re)purchase of TeleRead from NAPCO, which sold the site back to David in 2015. Taking over from Juli, in August 2015, was Chris Meadows, aka RoboTechMaster. He is another long-time e-booker, hosts the TeleRead podcasts and was a guest on the Kindle Chronicles podcast. Check out his interview with one of his favorite novelists, Diane Duane. A science fiction reader, Chris also is a games enthusiast. He is the author of The Geek’s Guide to Indianapolis. A graduate of Southwest Missouri State University (now Missouri State), Chris holds Bachelor’s degrees in Mass Media and Computer Information Systems. Chris has worked in technical support jobs. As a tech writer, too, he has learned the challenges of explaining technology to newcomers. Chris started writing for TeleRead back in 2006; except for a brief stint at The Digital Reader blog, he has been with us ever since. We’re endlessly lucky he has stuck around. Due to the time requirements of Chris’s current full-time job, he is now editor emeritus rather than editor, but within the limits of his schedule, he will contribute as a senior writer.